Abortion is, and always has been, an arena for contesting power relations between women and men. When in 1973 the Supreme Court made the procedure legal throughout the United States, it seemed that women were at last able to make decisions about their own bodies. In the four decades that followed, however, abortion became ever more politicized and stigmatized. Abortion after Roe chronicles and analyzes what the new legal status and changing political environment have meant for abortion providers and their patients. 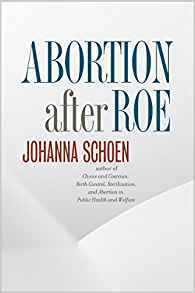 Johanna Schoen sheds light on the little-studied experience of performing and receiving abortion care from the 1970s–a period of optimism–to the rise of the antiabortion movement and the escalation of antiabortion tactics in the 1980s to the 1990s and beyond, when violent attacks on clinics and abortion providers led to a new articulation of abortion care as moral work. As Schoen demonstrates, more than four decades after the legalization of abortion, the abortion provider community has powerfully asserted that abortion care is a moral good.